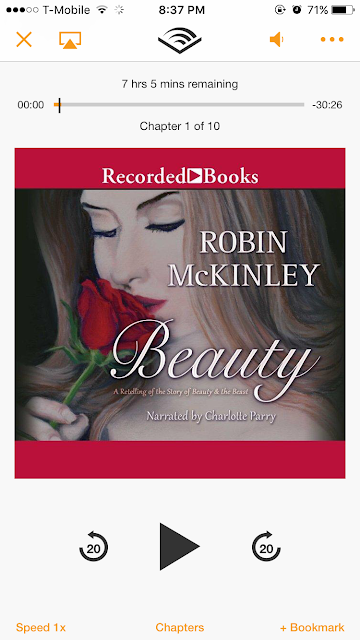 After reading Sunshine and seriously loving it, then finding out the same author wrote a story on the classic (and my absolute favorite) Beauty and the Beast, I knew I had to read it. Robin does a great interpretation of this story. In it, Beauty (her real name is Honor but she didn’t like it as a child and everyone started calling her Beauty) has two sisters, Grace and Hope, and they live with their father and brother-in-law. On his way back from a trip into the city, Beauty’s father gets lost and seeks help and shelter in what turns out to be the Beast’s castle. On his way out, the father takes a rose from the Beast’s garden. The Beast stops him and he is NOT happy. The Beast demands one of his daughters (or him) to come back in one month’s time as repayment. I really like this version of the spell places on the Beast’s castle. Instead of turning everyone into objects, they are invisible. With a bit of magic thrown in for good measure.